12.06.2006 the 2006 edition of "Stile Italiano Giovani" was won by Ross McSherry for his design work entitled "Alfa Romeo Villa d'Este"
More than 140 young people from all over the world have taken part in the 2006 edition of "Stile Italiano Giovani" which was won by Ross McSherry for his design work entitled "Alfa Romeo Villa d'Este". 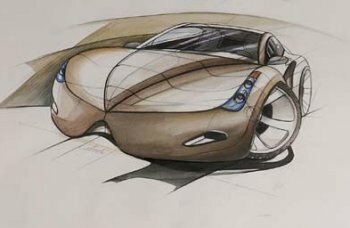 The contest, which is an opportunity to express creativity in car design is held bi-annually, and is open to all young mean and women between the ages of 18 and 28 provided they are not professional car designers. "Stile Italiano Giovanni" is organised by ANFIA, the Italian motor manufacturers' industry organisation, and supported by the Camera di commercio industria artigianato e agricoltura in Turin, under the patronage of the Regione Piemonte, the Ministry of the Economy and the European Union. It is held in the headquarters of the Camera di commercio in Turin - located in Via Carlo Alberto 16 – with the winning works being presented in public from the 8th to the 18th of June 2006. The bjective of the event is to display to the automotive sector operators and the public in general the best twenty projects selected among those presented by young non-professional designers enrolled in the Competition. The prestigious jury this year was headed by Leonardo Fioravanti, the founder and owner of the Fioravanti design and engineering concern, and they were tasked to choose the twenty best works. The contest, which is an opportunity to express creativity in car design is held bi-annually, and is open to all young mean and women between the ages of 18 and 28 provided they are not professional car designers. 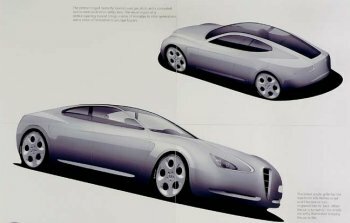 The 2006 edition of the "Stile Italiano Giovani" contest was won by 23-year-old Ross McSherry for his design work entitled "Alfa Romeo Villa d'Este"
The winning designs were entitled "Alfa Romeo Villa d'Este" and submitted by Ross McSherry, a 23-year-old from Great Britain, who was handed his prize by Alessandro Barberis, the President of the Turin Chamber of Commerce. Second place went to a design called "Astrocar" by Lilia Chernaeva, a 25-year-old from Bulgaria, while third place went to Adrian Stellino, an 18-year-old Italian whose work was titled "Fiat AS". Two other awards handed out were the "Auto & Design" trophy, which went to the "Volvo S20" by Davide Varenna, a 17year-old from Italy, and another was presented by the Association for the Industrial Design and given to "Innocent Basis" drawn by Peter Symonds a 23-year-old from Great Britain. The twenty drawings will be exhibited until the 18th of June at Palazzo Birago, the seat of the Turin Chamber of Commerce, via Carlo Alberto 16. The exhibition, which is free, is open every day from 10.00am to 10.00pm.